Rasheem Thomas, who is credited with saving lives after the Harlem blast. 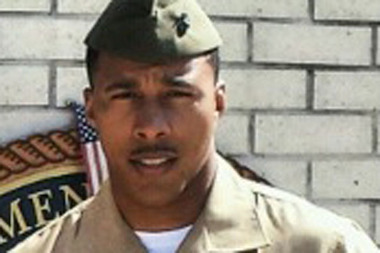 MANHATTAN — U.S. Marine Sgt. Rasheem Thomas survived last year's East Harlem explosion and a 12-hour firefight in Afghanistan — now he's trying to survive New York City's housing and job markets. As he starts his post-military life, the 27-year-old veteran needs to find a home for himself, his daughter and mother, as well as a new job. "I definitely know I would like to do something that is oriented towards helping people,” Thomas said. "2014 was a very dramatic year, coming back from Afghanistan and losing friends there, and then knowing I could have been killed in East Harlem. I try to turn the losses into a positive memory, of great men doing great things for country. And I count my blessings." Thomas' six-year stint in the Marine Corps included a Sept. 14, 2012 assault on Camp Bastion, where Taliban fighters dressed in army fatigues attacked using suicide bombers and automatic weapons. At the end of the battle, two of the marine's colleagues were dead, along with 15 Taliban and another in custody. "I think of them every day," Thomas said. While home on leave last March, Thomas thought he was thousands of miles away from the horrors of war as he dozed on a sofa in front of a television in his apartment at the southeast corner of East 117th Street and Park Avenue. Suddenly, he was jolted awake by a massive explosion. His military training kicked in. He thought a Metro-North train on nearby elevated tracks might have derailed, but then he saw the chaos — and two adjoining buildings that had been partially obliterated by a gas explosion. “Debris was shooting from buildings, smoke everywhere, cars buried and people running, some in shock, some covered in blood,” he said. He started ordering people away from the scene. Then he saw a well-dressed man covered in dust. He was an FBI agent who responded to the explosion. He told Thomas that he was at red light in front of the building when it was crushed suddenly by a new round of falling debris. He managed to get out, he said, but his partner was trapped inside. Thomas ran to the vehicle. The agent was lying flat in his seat with the crushed roof an inch from his face. “A little further and his neck would have been broken, that’s how far down the roof had collapsed,” Thomas said. The agent's legs were pinned beneath the crushed dashboard. “I got a knife and cut the seatbelt and started grabbing his leg," Thomas said. "But it was wedged in pretty bad. He had scars on his face, arms bruised, and was covered in debris. “I just yanked him until he was out. He was bruised pretty bad, but he limped away and we got him up to 117th Street." Three minutes later, the building began to completely crumble, burying the car with even more debris. “It looked just as bad as Camp Bastion did,” Thomas said. He then realized he had not seen him mother and daughter since the explosion. For a frantic hour, he tried to find them before learning they were in a nearby school gymnasium. The family then had to try and figure out how they were going to survive the next few days. Edward Duran of the Marine Corp Law Enforcement Foundation heard about Thomas saving the FBI agent, and contacted him. The MCLF funded hotel rooms for Thomas, his mom and daughter for a few weeks until their building was declared safe enough to return to. But his mother is so unnerved she wants to move. Thomas, meanwhile, returned to Camp Lejeune in North Carolina. He is weeks away from being discharged after serving his country in Spain, Italy, Romania and finally Afghanistan. He said the holiday season was tough for his company and the families of his fallen comrades. He says he has a few apartment leads and a couple of possible job opportunities. He would love to become an FBI agent, but has to get a college education. "I nearly lost my life," he observed. "So I am looking forward to what is coming on the new journey this year. "But I will tell you," he added, "I will never forget the last two years."